We’ve all heard of games being cancelled. It usually happens midway through development when the publisher cuts the funds or forces the developers to work on another project. At the end of the Saturn’s lifecycle it also became alarmingly common to pull the plug on games that were all but finished, usually multiplatform games where the Playstation version went out as usual while the Saturn one got dropped in the bin. Frustrating as that was, at least you could still play the game, albeit on another platform, so all was not lost. And then there were games that simply died on the final stretch and never saw the light of day, period. Armed (alternatively known as Aftermath) was one of those games. Until now. 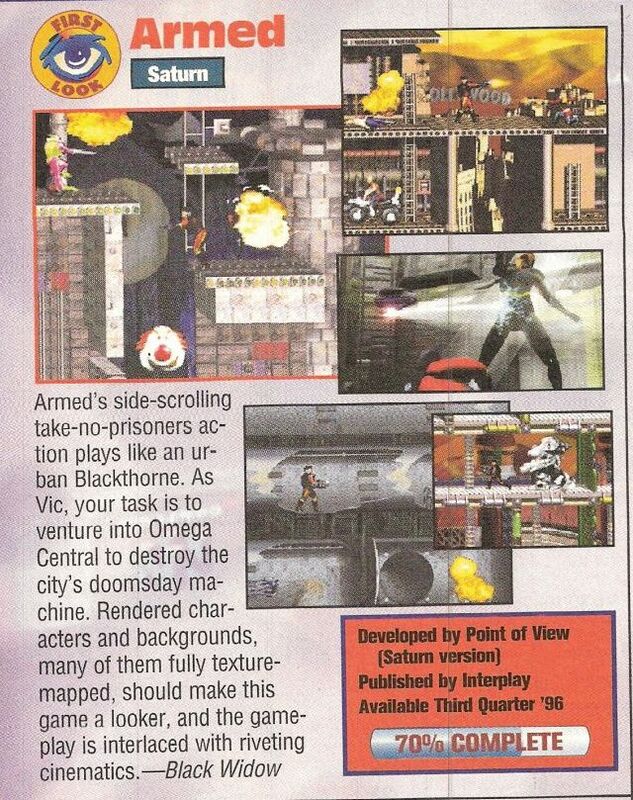 Developed by Point of View to be published by Interplay, Armed got so far as being presented at E3 1997 and making the news in some gaming magazines before being quietly cancelled. Many years have passed since then, until it unexpectedly resurfaced just a couple of months ago when a prototype disc went up on eBay for the very generous sum of $2,500. And yes, it sold. Don't be jealous, though. Thanks to the generosity of both the previous and the new owners, and the efforts of Assembler Games member A Murder of Crows (with some assistance by F1ReB4LL from the Redump forums), who has dumped, archived and released a copy of the game for free, we can all enjoy some unreleased gaming goodness. Is it any good, though? Well, that’s complicated. Well should keep in mind this is not a 100% finished version, which is why I don’t feel comfortable writing a proper review. Still, most of the game seems to be here. There are no FMV’s, so the story is basically non-existent, but the graphics, sounds and gameplay all seem to work as intended (despite the rumour that this prototype was missing sound effects). As you can gather from the video above, Armed is a sidescrolling shooter/platformer/puzzle solving game in a style that came to be known as the cinematic platformer due to people mistaking the awkward controls for “realism” (I kid). The first level is ironically the worst in my opinion, which makes for a pretty terrible introduction. The visuals are uninspired, the structure is atrocious being a cramped, vertical and mostly linear level, and the reliance on key cards to progress is taken up to 11. You can’t take 2 steps without needing a key to advance, and to make matters worse the game forces you have to backtrack constantly. Imagine going in a one way route to collect a key near the end, only to immediately have to go at it again because the lock for that key is somewhere in the middle. The enemies also respawn constantly and there are no checkpoints, with every death meaning starting over from the beginning. Speaking of enemies, you can shoot in 4 different directions (straight ahead, crouching, at a 45 angle or straight up) but when you’re up against small flying drones that quickly feels inadequate, with them easily moving out of your firing line and forcing you to reposition yourself. Also keep in mind you have no melee attack, and your pistol only starts causing damage at some distance, so if you’re face to face with an enemy run like hell. Fortunately things start to pick up on the second and third levels. They’re more expansive and open ended, as you’d expect from other games of this type. It starts to rely less on keys and similar objects to advance, which are still there but more spaced out, and the enemies become bigger and easier to hit, although they’re also more prone to hit back and since you have no defence moves whatsoever and controlling your character is a pain, you still have to be really careful. The game also starts to throw some unique levels at you to keep things interesting, like an out of control train which you have to stop in 2 minutes flat, or another one set in a freakish circus where you have to collect scattered tokens to activate a spring that propels you to the exit. The lack of a manual or any in-game hints towards new mechanics can cause some road bumps for the player, like the train level where it's not immediately obvious that you have to shoot certain structures to extend ladders, or the one that really stumped me, the dark circles in the background of level 7 that act as portals and are the only way to progress through the stage. On a technical level, this game hits some interesting notes. The graphics are exclusively 2D but instead of going for a hand drawn look, the developers opted for a mixture of that plastic CGI look so common in the 90's for the backgrounds and digitised models for the character and enemies. It won't win over every player but it's competent enough, with smooth animations and decent variety over the course of its nine levels. I found the soundtrack particularly impressive, mostly because I'm not usually one to notice it but found myself really liking some of the tunes. Like the rest of the game it's very inconsistent, with atrocities such as this, but at the same time offering some really catchy tunes like this or this. And that's the kind of mixed bag that summarises Armed. This is not a 100% complete prototype, but it's not just a one level wonder either. Not amazing in either graphics, sound or gameplay, but not terrible either. You'd think it all averages out to make a, well, average game, but I have to admit I really took a liking to it. It's not essential in any collection, and the gaming world didn't become a much poorer place for its cancellation, but it still very well deserves a look, and not just for the historic curiosity it represents. There's fun to be had with this game, if only you look deep enough. My pleasure. I got a kick out of doing this, it felt like exploring uncharted territory which is a real rarity for such an old console.